Allow me to offer a case study: me. Last year I stopped playing video games, mainly to focus more on my parental responsibilities. As I look back on myself, and as others have voluntarily told me, my demeanor is calmer, more relaxed, and friendly. I recently witnessed to someone, “I’ve never had a calm, relaxed game of Call of Duty online.” Thrown controllers, fowl words spoken, fits of rage were all inevitable. Yes, I enjoyed violent movies, too. It all blended together. My appetite was insatiable. Today, though, none of that really appeals to me. If these games affected me as an adult, how much more so would a child be affected? Yet, it is not uncommon for an 8-year-old to play a game that rewards extreme torture, killing, and prostitution. And, as this illustrates through studies, most parents do not consider a video game’s rating prior to purchase. As the authors write, “It’s certainly not normal for so many kids to want to kill, harm, bully, or hurt others as they do today.” Violent media and violent video games are proven to lead to: 1. Increased aggression, 2. Increased fear, 3. 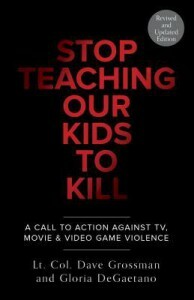 Desensitization to real-life and screen violence, and 4. Increased appetite for violence. If you are a parent or guardian, please read this book. The authors also include many resources on how to prevent or filter violent content from getting to your vulnerable children. Together, we can turn the tide and make this world a more peaceful place. Thank you to Harmony and Crown for sending this book to me for review.